Where you'll find over 40 artists and artisans in the communities of Hannibal, Louisiana, and Clarksville along a 50 mile stretch of beautiful Scenic Highway 79. Participants along Missouri’s first Scenic By-Way are excited about living and creating art along the beautiful Mississippi River, and want to share their studios, galleries,art and unique shops with you. 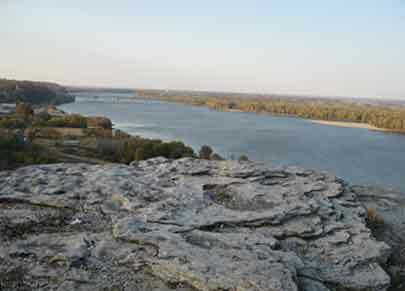 While you're here visit the eagle nesting areas near Clarksville, Mark Twain's boyhood home and Lover's Leap (shown above) in Hannibal and the famous murals of Louisiana, also home to Stark Brothers Nursery.